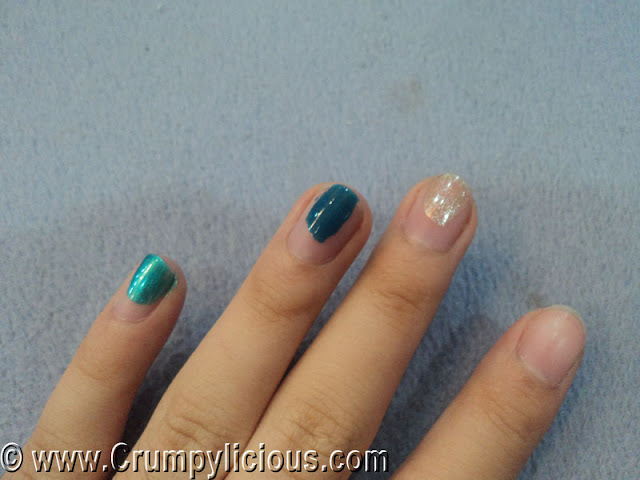 Sometimes, it feels great to pamper your self up to add some self-esteem. 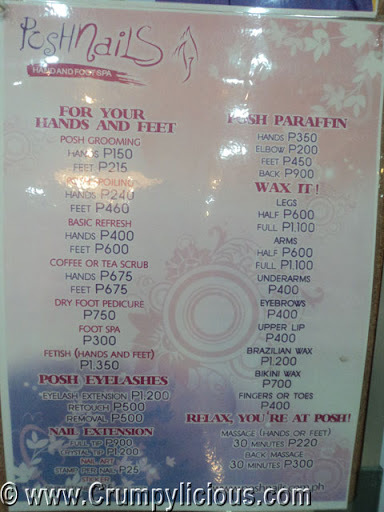 So one fine Saturday, Kurt and I decided to try out the services of Posh Nails Binondo. 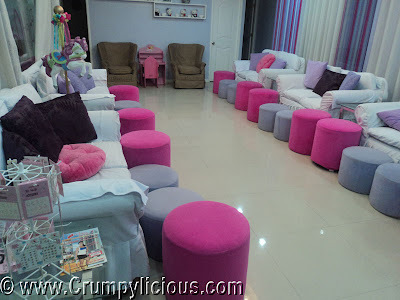 The place has a cute colorful ambiance. It has a purple and pink color scheme that reflects it being posh. Prices are posted on a bulletin board. 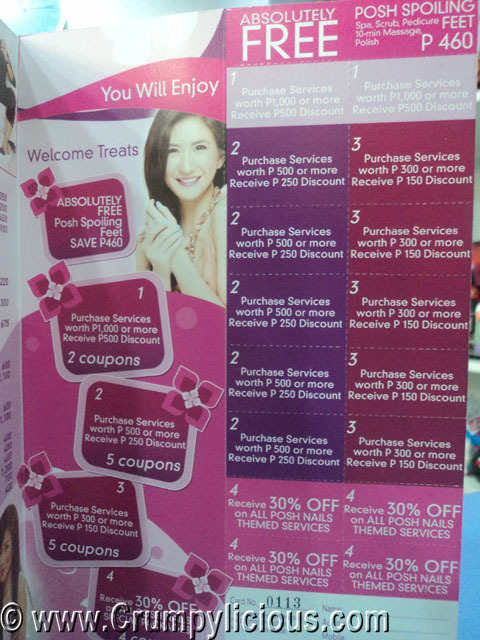 Their services can be costly but they have a lot of promos and packages. Posh Nails Binondo offered nail art. But, we did not avail of it since we were in a hurry. The place was crowded when we got in so they were short of staff. We waited for awhile before it was our turn. We availed of the Posh Grooming and the Foot Spa. They had a lot of nail polish selections. I made some samples to decide which color I wanted to try. 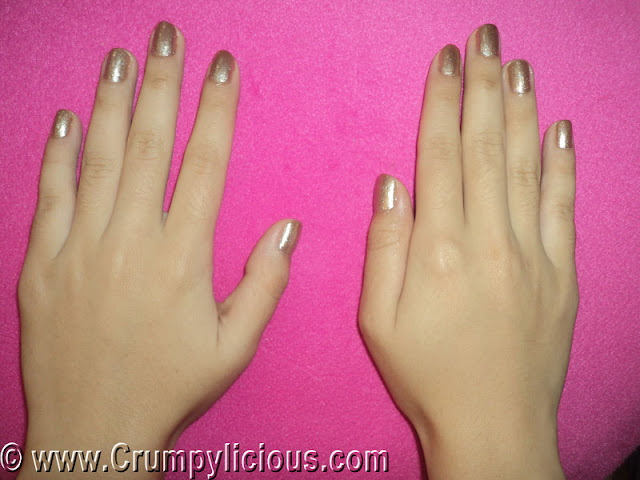 Just to break the monotony, I decided to go for something glittery. The grooming was okay. They treated my hands gently. 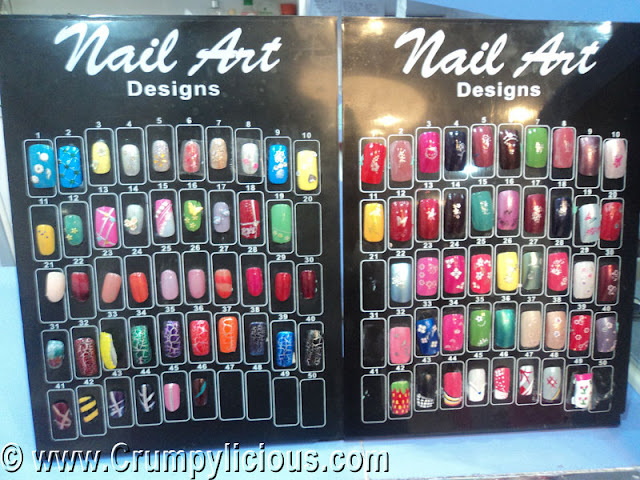 While I was having a manicure, I can't help but notice their that their kit are also cute and trendy. It is also part of their color scheme. 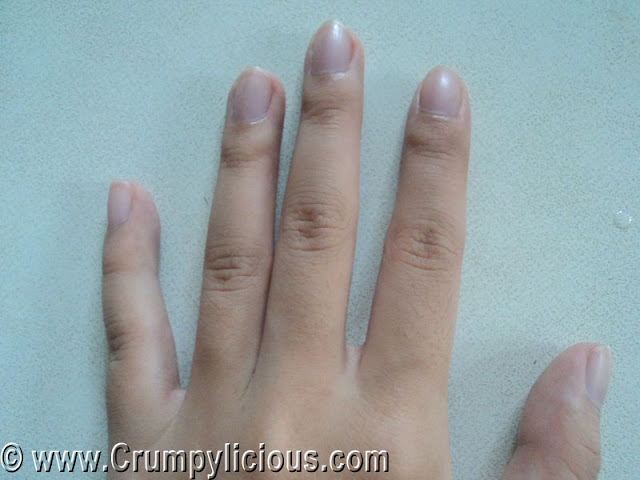 Above is my hands before I availed of the manicure. 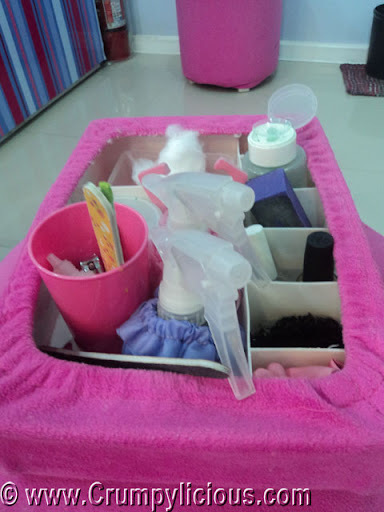 The Foot Spa involves dipping your feet in the foot massaging machine while having a manicure. After which, your feet will be dipped into a tub of warm water. 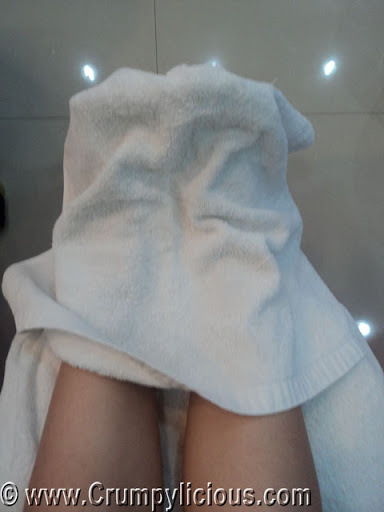 Then, it will be dried with a towel and massaged for 5 minutes. 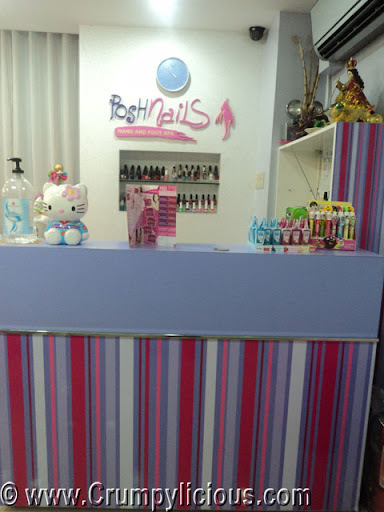 Overall, the service at Posh Nails Binondo is pretty good. The staffs are friendly and nice. Better if you call for reservation. 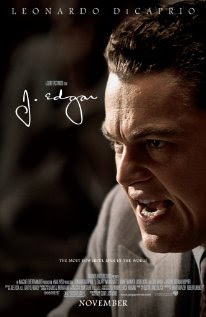 J. Edgar is a drama and biography about Federal Bureau of Investigation (FBI) director J. Edgar Hoover on how he managed to hold on to his position and how he managed to establish the Federal Bureau of Investigation according to his ideals. This involves his visions, life lessons, secrets and more. However, this is not an in-dept biography but merely a great introduction. The acting by Leonardo DiCaprio was stunningly amazing as he brought the whole drama to realism. Perhaps, he could even win some awards. DiCaprio and his co-star Armie Hammer was able to pull off it off with chemistry. Their portrayal was pretty good. The narration, order of the scenes, visual effects were sufficient to support the story. Although the make up is a bit flawed especially with Clyde Tolson's character. Overall, the movie was interesting to watch. I found myself immersed into the show curious about how his life went on. However, it may not be for everyone as we saw quite a number of audience walk out during the show. My mom is not much of a fan of Mexican food but she loved Mexicali. 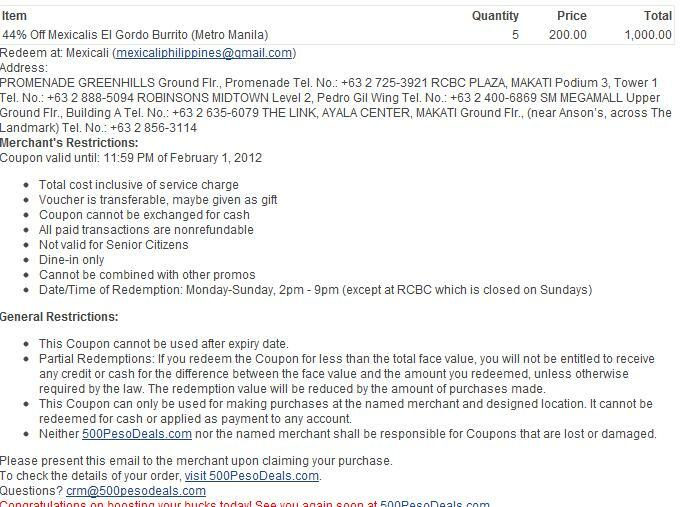 So when we saw this deal from 500PesoDeals.Com wherein we would get an El Gordo Burrito (295 php) plus a 16 oz Iced Tea (45 php) for only 200 php, we bought five of it. Everyone was excited as we went to the Mexicali Restaurant at Robinson's Place Manila. We had to choose that branch because it was very near our home. So we gave our vouchers to the manager. She then returned and told us that our voucher with a quantity of 5 is only valid for ONE El Gordo Burrito meal. All of us were very disappointed. Why else would we pay 1,000 php (200 php x 5) for ONE El Gordo Burrito meal worth 340 php?!? We told her it wouldn't be a deal if we would lose money but she was said " Yun nga po eh mas lugi pa nga po kayo" (That's right you lose more with the deal). Since all the others were closing around that time, we dined there not using the vouchers but asked her to call her superiors. When we finished eating, she still insisted on her beliefs based on her supposed training. We spoke to her superior who said we were right but the manager still didn't want to concede. We didn't . bother resolving it with her as we were all just tired. We paid our bill and left. 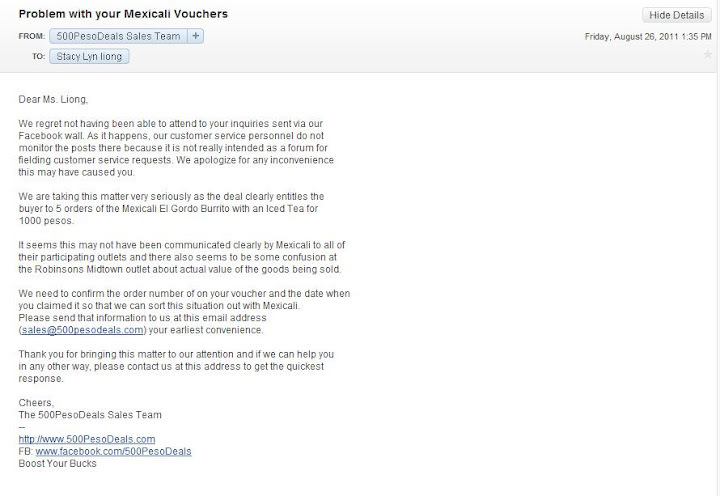 When we came home, I immediately emailed 500PesoDeals.Com but recieved no reply. I sent 2 more emails but to no avail. 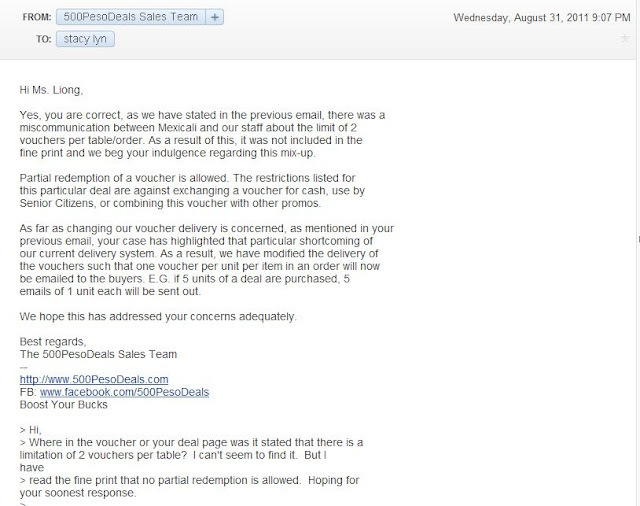 Frustrated, I posted on the 500PesoDeals.Com fanpage informing them I sent an email and that I am awaiting their reply thinking that they might not have checked their email. The next day, they removed my post and I was blocked from the 500PesoDeals.Com fanpage. Until now, I could view their fan page but could not comment there. My family was telling me that perhaps 500PesoDeals.Com is intentionally ignoring my emails and posts and that it was a scam. I was at disbelief because they partnered with Mexicali which is a reputable chain of restaurants so I emailed them again. 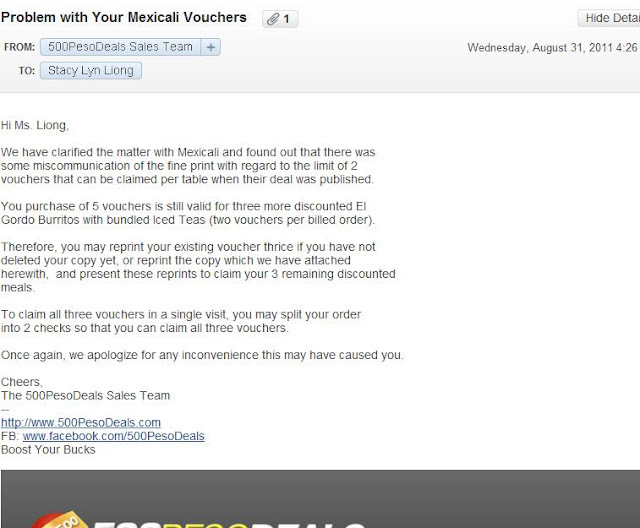 Due to our futile attempt with the emails, I posted on the Mexicali Restaurant Fanpage while tagging the 500PesoDeals.Com stating that as paying customers we deserved outmost respect. Suddenly, 500PesoDeals.Com replied on my email and we had the following exchanges through email. Everyone in the family was pissed and embarrassed over the matter so even though it was settled, we had to wait some time before claiming our coupon. I was the only one who still wanted to go back. When the day came when my family finally agreed to claim it with me, the manager was absent and the staff did not know about the voucher so they didn't want to honor it. Again, we had to call their head office until they agreed. The staffs looked unhappy. Once the El Gourdo was served, we requested for the iced tea which they again didn't know about so so again with the tedious process. There was an extra El Gourdo since we could no longer convince my little sister to eat with us so I brought it home. I was the only one who wanted to eat it so I did. In the middle of my El Gourdo there was a really long white hair which I had to pull out from my half-eaten El Gourdo Burrito. =( I was so disgusted that I wanted to cry. I'm writing this now as I looked at all the pictures I took with the intention that I could review Mexicali's food on my food blog www.tsinoyfoodies.com objectively. But honestly, until now, I could still recall the incident. I guess there are traumatic experiences, I could not let go yet. The Alcatel One Touch Blaze Glory 918N is so slick and stylish with it's elegant black color, slimness, shape, curved edges, large LCD display and quick buttons makes. As I tried the phone, I loved its smooth rubbery texture. It allowed you to get a good comfortable grip on the phone and prevents fingerprints on it. The Alcatel One Touch Blaze Glory 918N is the perfect Dual SIM entry-level smartphone. It has everything you need. It has a Capacitative LCD screen, WiFi, 3G, Bluetooth, G-sensor, expandable memory up to 32 GB, Mp3 music player,3.0 Megapixel Camera and more importantly, installed with Android 2.3. The Alcatel One Touch Blaze Glory 918N is the complete Dual SIM Android 2.3 entry level smartphone priced only at 5,999 php. The Alcatel One Touch Blaze Glory 918N may not be the most powerful smartphone but is sufficient to accommodate your basic business and personal needs. 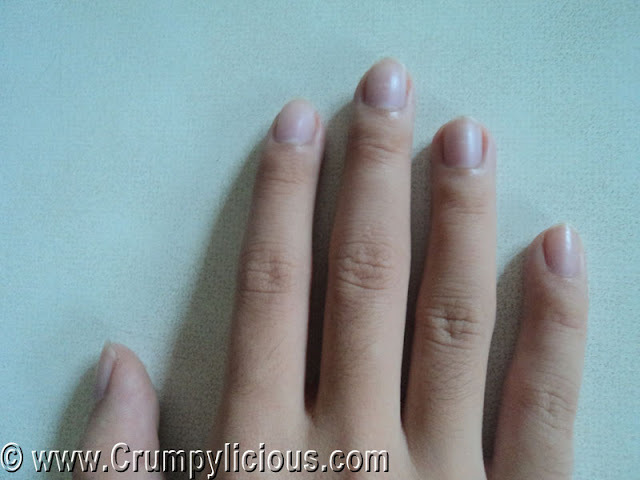 It can also handle non-hard-core android games such as Angry birds. Overall, its quite a steal at 5,999 php. Alcatel One Touch GLAM 810D Fashion and Function in One! If you can recall, I once shared our happy experience with our very first Alcatel modelled T-806D. (see previous entry) I have to admit at first, we had our doubts because it was very cheap and yet it offers a lot of functions. But it's been a year and the phone is still working well. Support is also very good. I once had a question and posted it on Alcatel Mobile Philippines facebook fanpage. The Alcatel Support personally messaged me. After three days, I was surprised that they were even the one to ask me if I figured it out already. I was very fortunate to get to preview their new fashionable and functional phones the Alcatel One Touch GLAM 810D and the Alcatel One Touch Blaze Glory 918N during the Alcatel Fashion meets Tech Press Launch. When I first saw the Alcatel One Touch GLAM 810D, I was instantly attracted to its looks. It was so chiq and cute! What a brilliant idea to have the phone designed as a powder compact. 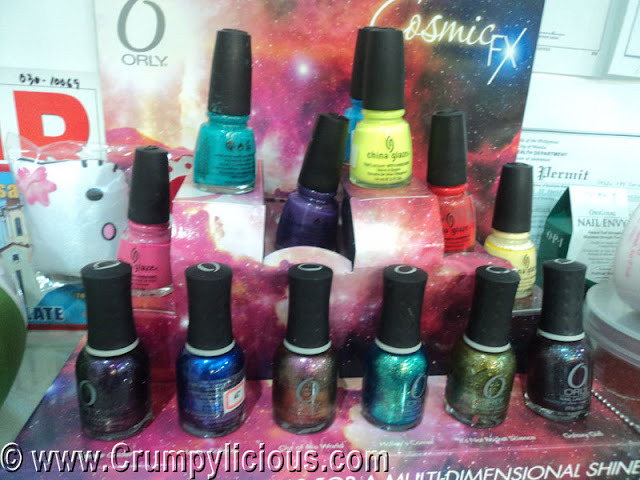 Plus, the colors are so nice. 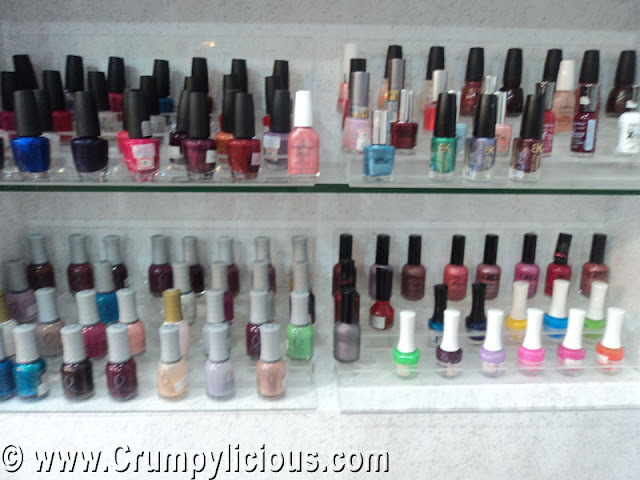 It was Mystery Pink and Light Chrome. I think the Mystery Pink is just adorable! I was amazed that in its compact size and share, the Alcatel One Touch GLAM 810D had a QWERTY keyboard for fast text and typing. It also has a 2.4" screen which was just the right size for easy reading. Upon closing the clam shell-type Alcatel One Touch GLAM 810D, it made a cute sound and there was a whirling pinwheel. Soon, the LED display showed the time. I thought... how convenient that you can also use it like a watch without having to flip it open. More important than the fashionable exteriors is the function. The function that enticed me is that despite being compact, the Alcatel One Touch GLAM 810D is Dual SIM phone. It also has a music player. I'm happy to hear that it has the standard 3.5 audio headset because I want to use my preferred headphones. The phone has a 2 mega-pixel camera so you can snapshot anytime you want. 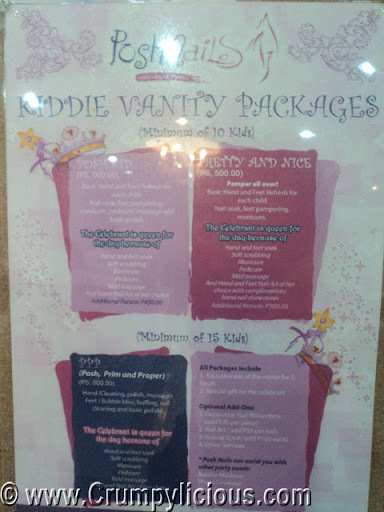 You can even take a picture of your crushes or favorite stars while pretending to be powdering. =p Since you'll be taking some photos and you are expecting a lot of messages from your two SIMs, you need more memory. The Alcatel One Touch GLAM 810D has a Micro SD card slot for expandable memory. The Alcatel One Touch GLAM 810D is amazing because it is fashion and function in one. 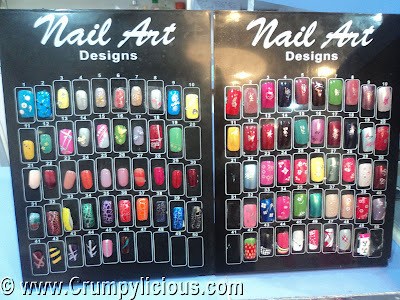 I was surprised that it was priced at only 3,999 php ($91). However, although the phone is complete with mobile browser like opera mini and social apps such facebook and twitter, it does not have a WiFi. I guess that's the downside of Alcatel One Touch GLAM 810D's affordable price tag. Feeling down from time to time is a very normal part of life, but serious depression could keep you from doing the things you enjoy. Those who haven’t felt the sting of depression usually don’t understand the crippling affect it can have on a person. Depression is a disease that may never completely go away, and it needs to be tended to with sympathy and care. Depression affects one out of every ten adults in the United States, and women are more likely to be affected, so if you think you may be depressed don’t feel like you are alone. It really is more “normal” than you may think. Depression is defined as a mental state of altered mood characterized by feelings of sadness, despair, and discouragement. It can affect how you feel, think, and behave. This illness isn’t a weakness or something you can simply decide to stop on your own. It truly is an illness that takes long-term treatment, like heart disease or diabetes. There is no universal cause for depression, but we also know that you don’t necessarily need a reason to feel depressed. A combination of stress, genetics, hormonal changes, emotional setbacks, and/or tragedies can all come together to make a person feel depressed. Depression affects everyone differently, so someone may have many of these symptoms while others may only have a few. If you think you may know someone who is depressed, reach out to them. You could make a huge difference in that person’s life. If you are feeling depressed, try your best to ask for help from those closest to you. Your friends and loved ones could be your greatest allies during this hard time in your life. Also, if you are having thoughts of suicide, seek help from a professional immediately. There is hope, and people to help you find that hope. You may feel uncomfortable talking to your friends or loved ones about your depression, so it could be easier for you to talk to your doctor. Ask him or her to recommend a psychologist, social worker, or counselor. If you are comfortable talking to your friends or family, ask them for recommendations, and learn more about the approach each therapist will use before you decide on one. Having this disease may be hard to accept, but you should know that it isn’t your fault. With help, you can beat depression; you just have to make the first step. Postponing treatment and trying to struggle from day to day will only make you feel more miserable. Your family or career could suffer, and the longer you put off treatment, the harder it may be to gain control of your life. Don’t get discouraged. Feeling helpless and hopeless is a symptom of depression, not your reality. Kristin Mullen is an author who writes guest posts on the topics of business, marketing, credit cards, and personal finance. Additionally, she works for a website that focuses on educating readers about debt consolidation. 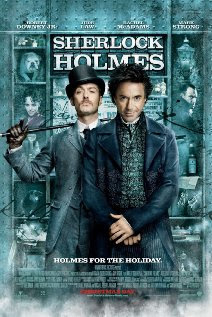 More action and mystery unfold as Sherlock Holmes and his trusted associate Doctor Watson tries to solve their case. The Sherlock Holmes: A Game of Shadows is a sequel to the first Sherlock Holmes movie. Enjoy the same humour, action and mesmerizing imagination and flow of thoughts as the first one but more in depth in terms of the mystery and story. No doubt in terms of acting as Robert Downey Jr., Jude Law and other casts has proven their worth before. I may have second thoughts about the flow of logic of the ending... But, overall the movie was great! Every scene was as enticing and entertaining. This is certainly a must watch for all Sherlock Holmes fans. Watch Sherlock Holmes: A Game of Shadows! After 10 long years, our old television decided to retire. It didn't want to turn on after a power glitch occurred. Deciding on a replacement wasn't easy. We're not sure what the family wanted. I personally don't mind at all since I don't watch that much. 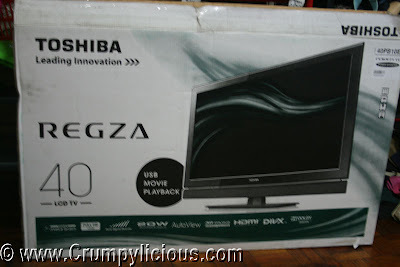 Being in the business of selling tvs, we had the chance to try out several televisions and finally settled for the 40 inch Toshiba Regza LCD TV modelled 40PB10E (priced at 29,500 php to date). The first thing we needed to decide on is whether we wanted a Plasma TV or an LCD TV. Surely, a Plasma TV offers better quality for both television and movie. It also has a very long life of 30 years. 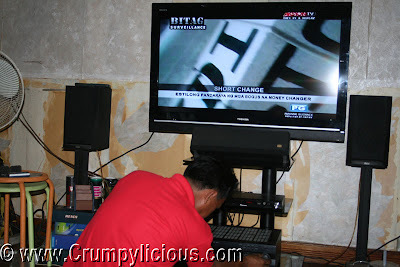 But, considering the it consumes more electricity, we opted for an LCD TV. Electricity is expensive in our country and it increases from time to time. We measured the distance from the couch to the place of the television and determined that 40 inches was the right TV size. We chose Toshiba because according to the technicians it is the most durable brand. It rarely has an problems. Here in the Philippines though, I noticed that Samsung is more popular. It was installed by the technician and soon the channels were programmed one by one. The 40 inch Toshiba Regza LCD TV modelled 40PB10E shows both television and HD movies are beautifully shown. You just have to know the right settings otherwise the picture might look grainy. As soon as the technician left, my brother was so excited he played his PlayStation 3 all night long.